Finally got around to downloading photos from my OTHER camera that I took to Australia to see the premiere of my play THIS ROSE HAS THORNS. The cast and crew . . . and a visiting playwright. Director John Smith talks to the cast. This was one of the most amazing sights I’ve seen: The cast gathers before the show for a pre-show rally, led by actor Nick Sidari (somewhere in the center of this scrum). Lots more backstage photos here. Poster by Julia Allen. Photography by JoKa Photography. Here’s a new and very amazing poster for my show THIS ROSE HAS THORNS, which opens April 5 in Melbourne, Australia. A parody of some common Shakespeare themes, with good stage combat roles for women and girls. The daughters of a lord receive letters from their boyfriends, informing them that they have been imprisoned in the Tower of London and expect to be executed. The two girls do what seems only natural to them; they dress up as men and set off to London to rescue them – not realizing that the boyfriends intended these as break-up letters. Comedy ensues. Cast: 13 – 7 females, 6 males. My script THE ONE-WORD MACBETH has had a fantastic run in Australia, winning awards for the Pop Culture Theatre in various one-act competitions in the state of Victoria. You can read about those here. Now there’s just one more show to go, on October 17, in the theatre’s home base in Melbourne. Here’s the poster. Pop Culture Theatre of Melbourne won another award this weekend with a production of my script THE ONE-WORD MACBETH. 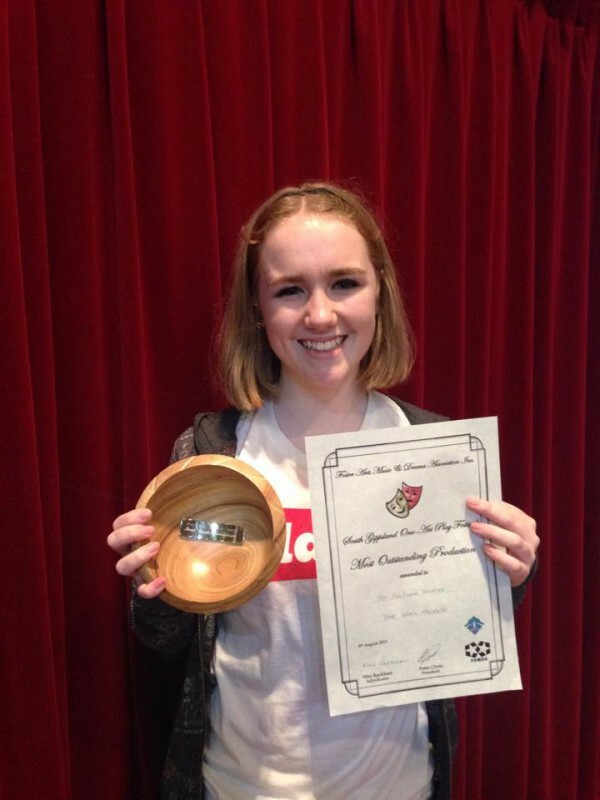 The production took “Most Outstanding Youth Production” in the South Gippsland One-Act Play Festival in Foster, Australia, one of a series of festivals through the Victorian Drama League that the group is entered in. 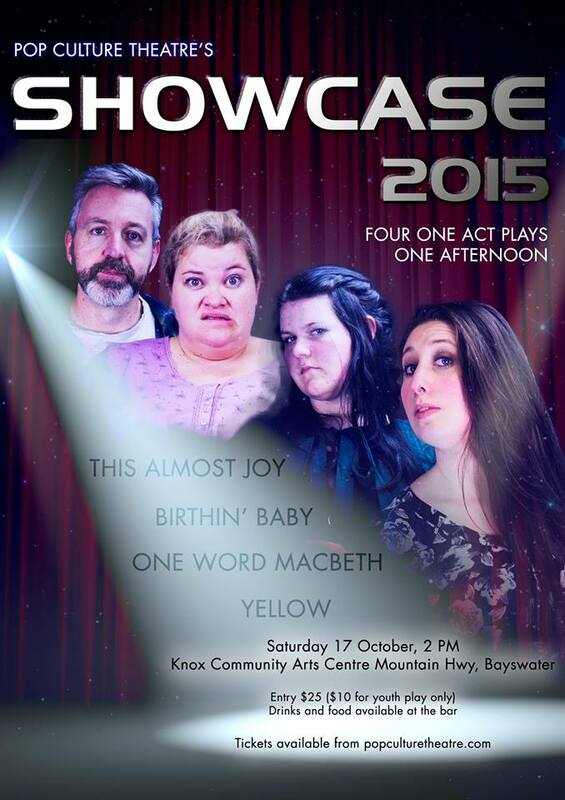 Next up: Kyneton’s Festival of One-Act Plays in Kyneton on Sept. 4-6 and a date TBA in October in Melbourne. You can find photos from a previous production in Macedon here and more about the show in general here. I’ve just scored my first production in Australia. Pop Culture Theatre in Melbourne will produced my longish one-act, THE ONE-WORD MACBETH, this summer. As I understand it, the script will be done at the theatre, and then entered in three or four competitive festivals put on by the Victorian Drama League. The Macbeth story, told with each character speaking lines that cost of only one word. Complete with witches and sword-fights, but limited dialogue. Cast: Ten or twelve or fourteen. If ten, 4 male, 4 female, 2 non-gender. If twelve, 4 male, 4 female, 4 non-gender. If fourteen, 4 male, 4 female, 6 non-gender. Running time: 45 minutes. * Produced by West High School, West, Texas, Feb. 16, 2008. The classic Greek drama Antigone, more or less, in which each line consists of just a single word. Ideal for a class project. Cast: 10 – 3 female, 4 female, 3 non-gender.. Running time: Twenty five minutes. The story of Hamlet, much condensed, in which each actor speaks only one word at a time. Cast: Thirteen — 11 males, 2 females. There’s potential to double two male roles. Running time: Fifteen minutes. • The eight-minute version of this script was performed in a staged reading in Herring Run Arts Fest, Middleborough, Mass., September 2005.
character uttering just one word at a time. Cast: Seven — 6 male, 1 female. 3 male, 1 female. Running time: Fifteen minutes. * Summer: THE ONE-WORD MACBETH, Pop Culture Theatre, Melbourne, Australia.